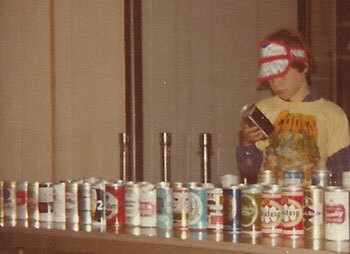 Reviewing some potential trades at a “can-vention" (circa 1980). 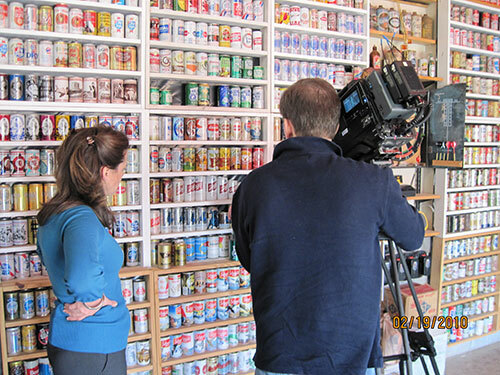 Scott Mertie’s fascination with beer started in the 1970s when he started collecting beer cans at the age of 6 years old. Through the encouragement of his parents, his collection amounted to over 3,000 cans by the time he was in high school. Scott’s beer can interested expanded into other types of breweriana (brewery advertising) and he began visiting old brewery sights close to his home in Northeast Ohio. Exploring the vacant building which was once the Akron Brewing Company (1903-1919). Fermenting first batch of home brew at 18 years old. 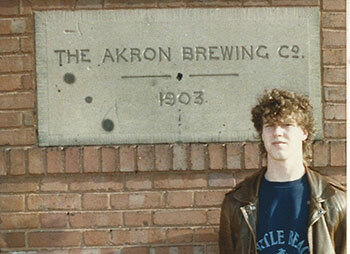 Scott discovered home brewing in the late 1980s as a freshman at The Ohio State University. Craft breweries were essentially nonexistent, but he started to replicate the imported Belgium, English, and German styles that he picked up at various beer stores (not your typical college brews). At this time, craft breweries started popping up around the country. Scott made it a point to visit as many as he could. Some of these first ones included Great Lakes (Cleveland), Hoster (Columbus), and Oldenburg (northern KY near Cincinnati). 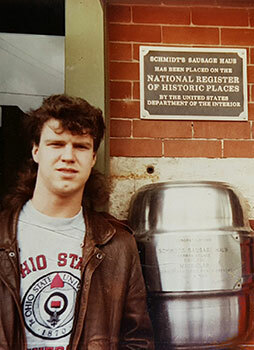 Learning about imported beers in college at Schmidt’s Sausage Haus. Vsiting Tennessee's first micro-brewery, Bohannon Brewing Company (1988-2004), brewers of Market Street Beer (circa 1992). After graduating with an accounting degree in 1992, Scott moved to Nashville to work in Nashville’s growing healthcare community. 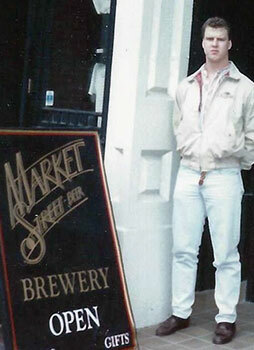 Scott’s beer hobbies continued as his professional career blossomed. 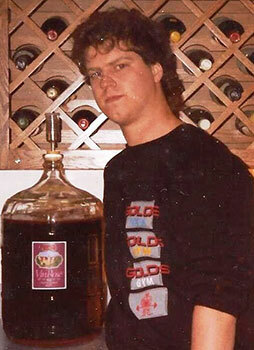 By his mid-30’s, Scott was a successful home brewer, winning medals in various brewing competitions. While traveling for business, Scott has been able to visit thousands of breweries throughout the United States and in five continents. 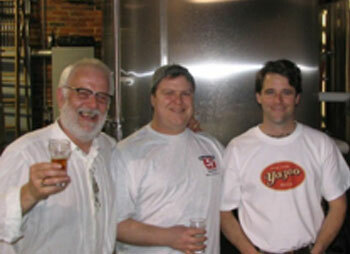 Getting advice from Brewmasters Fred Scheer (left) of Boscos and Linus Hall (right) of Yazoo (circa 2003). Wrote book Nashville Brewing, Arcadia Publishing (2006). 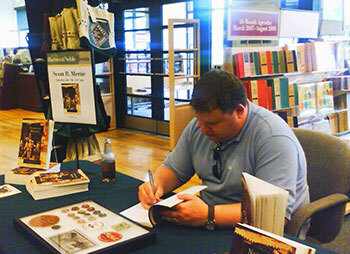 In 2006, Scott wrote his first book on the subject, Nashville Brewing (Arcadia Publishing). This book focused on Nashville’s brewing industry from the Civil War through modern day. Buy the book. 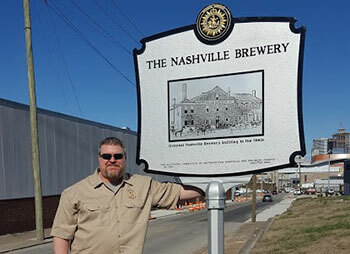 In 2010 Scott and his wife, Candy, spearheaded the Nashville Historical Commission to erect a marker where Nashville’s first production brewery operated - Nashville Brewing Company (1859-1890) and the Gerst Brewing Company (1890-1954). The Nashville Brewery historical marker, located on 6th Ave. S., was donated by the Mertie family. 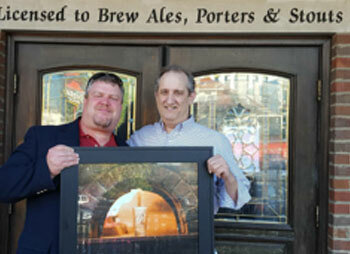 With Kent Taylor, co-founder of Blackstone Brewing Company (1994-present). While doing research for Nashville Brewing, Scott became fascinated with the city’s first real production brewery, the Nashville Brewing Company, which operated from 1859 -1890 (see more on Nashville Brewing Company's history). It was Scott’s dream to bring this brand back to Nashville and share the genuine lager beers that would have been brewed in the later part of the 19th Century. After much research, Scott teamed up with Blackstone Brewing Company to brew these historic brands. 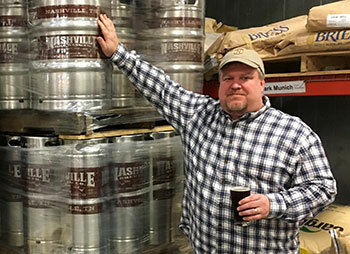 The Nashville Brewing Company released its first beer, Nashville Lager, in December 2016. Admiring the first batch of beer by the Nashville Brewing Company (2016). 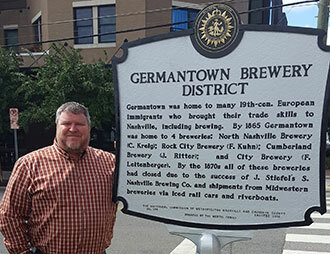 Scott Mertie with the Germantown brewery district historical marker. 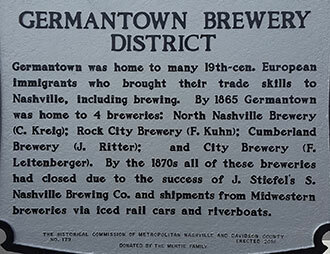 The Mertie family commissioned a second historical marker relating to Nashville's brewing history. This marker, located on 5th Avenue and Madison, represents where four breweries operated in Germantown in the 1860s. Read more about the markers on the Tennessee Craft Beer website. The Germantown marker was installed in 2018. What is Scott Mertie's favorite local beer he didn't brew? Find out by reading this Nashville Post article. Behind the scenes at the Tennessee Crossroads shoot. 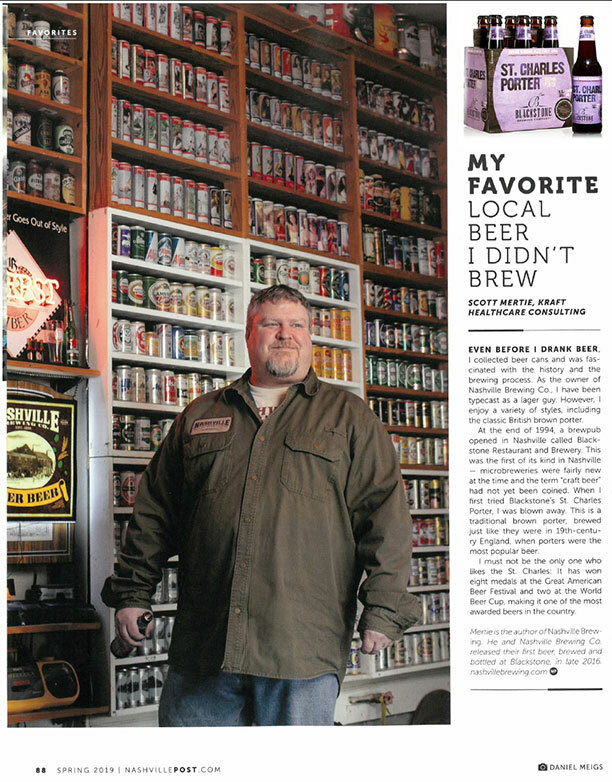 In 2010, Scott Mertie was interviewed by Tennessee Crossroads for a segment on his beer memorabilia collection. 3,000 beer cans in his garage! That's quite a collection! Watch the Tennessee Crossroads video below. You must be over 21 to consume alcoholic beverages.